I'm going to try to keep this up to date for our adventure vacation while we navigate from the confluence of the Wisconsin River and the Mississippi River (just south of Prairie du Chien) down to St. Louis, MO and then up the Illinois River to Starved Rock (Utica, IL). This trip has been one of those bucket list items for me. I've wanted to spend some time on the Mississippi for quite awhile now. I wanted to continue a river trip that had started quite a few years ago at Devils Elbow on the Wisconsin River just south of Nekoosa down to the Mississippi River (about 200 miles). I put together a slide show from that trip(s) here. That trip was done in my powered canoe. Where the canoe got pulled out of the Wisconsin River my pontoon boat will be put in. Accompaning me is very long time friend Sam. 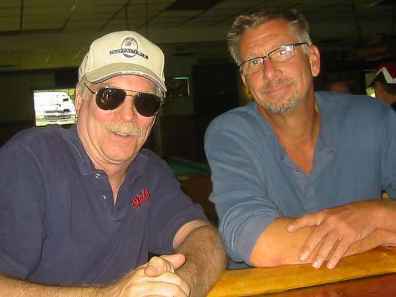 Over the last 35 years we have travelled to Glacier National Park, Yellowstone, Texas coast, Tennessee and more. . Preparation has been going on for quite awhile and my shopping list from Ebay has been long. We are not roughing it by any means. We not only have our cell phones but full internet access with the laptop through tethering on the cell phones. The laptop has full live GPS (on it's 15" screen) and high resolution (think Google Earth) satellite photo overlays on to the active GPS as well as the full set of Army Corps of engineers navigational charts. The pontoon has a hard top (for sun and rain) with full night time lighting underneath and half a dozen power points for all the toys. There's a couch in the back plus table and padded chairs. We are living on the boat for up to two weeks and what better way to query about the towns, cities and landmarks along the way than through the internet. We can also get details on weather, marina services, places to purchase supplies, to eat, etc. Most nights will be spent camping on some island or sandbar. We have a large pop up walled canopy with table and chairs. Air beds (with electric inflator) to sleep. Weber grill and coleman stove to cook. I enjoy camping but don't enjoy having to rough it. We even have our bicycles along to explore the local towns and cities along the way. Well I haven't kept up on this trip as I hoped. Getting out the laptop when it's 95 degrees out, dripping in sweat and full of sand just wasn't what I wanted to do after bobbing around the Mississippi for 10 hours. And, since I only have a mobile charger with me (and am currently in a motel room) this will be a bit brief as I only have the charge in the battery to get something posted. We are currently in Fort Madison, Iowa. The weather has been beautiful and almost cloudless. Unfortunately, every day has been 95-100 degrees and no matter how much SPF suntan lotion I use am still way too sunburned. So far, the trip has not been without more than a few challenges. 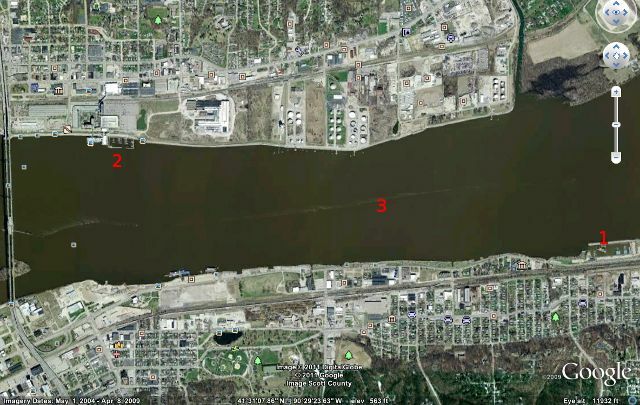 Stolen reserve fuel tank, broken main fuel tank, a few long waits (until after dark) at some of the locks, even hit and grounded on wing dam in the quad-cities. The logisitics of fuel and 50 lbs. of ice every day, etc. The most challenging part of the river travel is the Mississippi runs north and south and the wind has been strong and straight out of the south. Coming into a stretch that is 2-3 miles wide and 10-15 miles long brings continuous waves over the front of the boat. If it was just a short stretch to get through it would not be a problem, but to do that all day long gets tiring. Hence the motel break here in Fort Madison. Our first night's camp site and probably our favorite. Bug free with great swimming. This pic looks out across the main channel where the tugs run at night. This is looking across the side channel where the boat is parked. It's always better to get the boat off the main channel so it doesn't constantly get buffeted by boat wakes. Third night out. Not a bad site except the red-winged black birds antagonized Sam (hence the hat). You can see someone's duck blind to the right. We watered the potted plants growing vines for camouflage. We needed fuel and ice in the quad-cities (Rock Island, Moline....). The first marina we stopped at (#1) was not selling fuel and pointed us across the river to the Isle of Capri casino (#2) to fuel up. Unfortunately he failed to mention the very shallow wing-dam mid-river (#3) which we hit and grounded on. (I look at Sam - Oops, my bad.) On go the life vests and river walking shoes to step out on top of the underwater dam. Thankfully no damage and the pontoon only needs about 15" of water so we were able to help it over the underwater concrete dam. There are 100s of wing-dams on the Mississippi River but they are at leat 5-10 feet under water and jut out diagonally from the sides of the river, not run down the middle. They even had a really nice Tiki-bar. Dissappointed we couldn't get a Bloody Mary for breakfast though (beer and wine only - pffffft). The end to our journey came about 300 miles down stream in Quincy, IL. Ironically, it wasn't the high temperatures or wind and waves, but flying carp that persuaded us to call an end to the trip. I was aware of the Asian carp issue on the Illinois river, but did not expect them to be an issue so far up the Mississippi river. As we pulled into the pool at lock #20 at Canton, MO we had these carp bouncing off the boat from all directions. They jump high enough to actually go over the boat and can easily smack you in the face. At the very least, us, our gear and the boat would be constantly slimed and end up reeking of fish in the heat. You can see a professional video of the problem here where they are bow fishing for them or a home video here on a side stream. (There is a quick documentary on the carp problem in two parts here. Part I Part II.) We didn't want to spend the rest of the trip in fear of these fish and if we couldn't come back up the Illinois river then the further we went on the Mississippi meant a longer haul for the retrieval trip home. We decided to end the trip in Quincy. They had a nice marina, plenty of hotels and easy access by road. They don't call it the muddy Mississippi for nothing. I was ready for the lack of water clarity, but not the lack of sand bars. By the third day we couldn't seem to find a sandy spot to camp or swim. Many places appeared to be sandy, but when stepping off the boat you sunk up to your knees in sandy muck. Sand bars and sandy islands seemed to substantially be more prominent up north. Deep water swimming was difficult as there was no way to get back on/in the pontoon. Climbing in from the rear is best, but our bikes blocked access over the couch. The waves over the front became tolerable after we duck-taped the front door shut to keep out the stream of water under and around the door. A lot of people have been curious about the locks. They are very easy to get through. You can either pull up to the wall along side of them and ring the door bell (pull rope) or in our case, we called them on the marine radio (channel 14) and asked when they could lock us through. They were friendly and responsive. Many times it was really quick. But, a tug with 15 barges takes about 1-1/2 hours to get locked through so if you show up behind a tug, you can have quite a wait. If they don't have a full 15 barges then you might be able to lock through with them in the "notch" where a barge is missing. But only in the front, not next to a tug in the rear. It was quite easy to talk with the tug captains also (I'm sure they were bored). They all went by the name on their tug so it was easy to identify who is who when things got busy. Another interest of mine as we cruised down the river was not only the working tugs but the industrial side of the Mississippi at work. The amount of information two smart phones can gather as we cruise by river side industrial complexes is surprising. I suppose it's a bit geeky but so was playing "slug-bug" or finding license plates from as many states as possible when you traveled as a kid. Here's a quick slide show of a few of the sights. You can see the haze of 100 degree days with 80% humidity. Pool 13 (the lake in front of lock and dam #13) was one of our tougher stretches due to the wind and waves coming over the front of the boat. About half way through the pool we came across a couple of sandbar/islands completely dominated by birds of several species. Everything was guano encrusted or it might have made a welcome stop. by the dozen at one of the islands we visited. We had too much stuff and it took awhile to get things organized. water down a foot along the shore where we were parked. up. Built in 1910, it was the largest single power generation facility at the time. The Keokuk locks were the grand daddy of all of them. Dropped 35 feet. All the others are a 1-12 foot drop. Here is Captain Kirk's Marina in Fort Madison, IA. Gas, ice, drinks and food. It also offered a secure slip for the night. Keeping the laptop charger cool on the river. On the channel to the Quincy marina is this unique eatery called "The Pier". Very upscale with excellent food. We ate there after pulling out the pontoon. This clip shows just a few carp here and there as we tried to stealth creep into the lock so as not to disturb them. When we first pulled into this pool (making all kinds of noise), they were hammering the boat from all directions. The lockmaster laughed when we talked about it. He said they were "50 times as bad" on the Illinois River (where we wanted to go) and much bigger.